An entire outfit? For $30 dollars or less? Is that even possible? The answer is yes! I decided to invite Hailey and Brittany, two fellow freshmen FMDS majors, to the New River Valley Mall in Christiansburg so we could take on this challenge. This mall isn’t the best, but it does the job. Basically, this challenge is exactly how it sounds; an entire outfit for $30. Usually, people do it at just one store, but we decided to hit two stores, American Eagle and Charlotte Russe. American Eagle was our first stop, and we made a bee-line for the clearance section. Most of the time, clearance racks are full of leftovers from last season, but there was some really cute stuff! Brittany scored her first piece of her outfit, a sheer black flowy tank top for $14.99. Hailey and I were not so lucky. We found cute shirts, but, with American Eagle being more on the pricier side, they were not in our budget, so we made our way to our next stop. Just as we had done at the first store, we went straight for the clearance racks in Charlotte. They were full of bargains and, surprisingly, had some good stuff. We all decided Hailey won the challenge. She got the most stuff and STILL managed to stay under budget at $26.96 (not including tax). 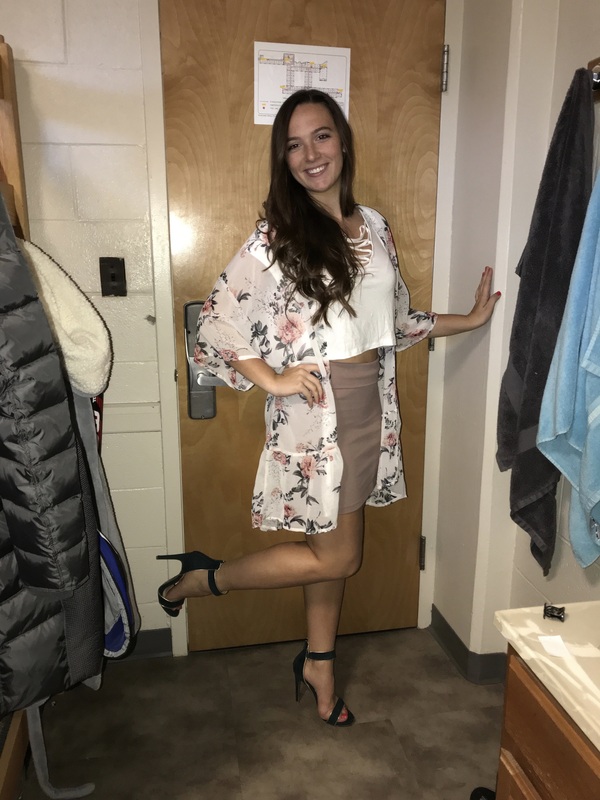 She found a pair of awesome teal heels for $4.99 and decided to base her entire outfit around those. She paired them with a taupe skirt for $4.99, a white top for $6.99, and a floral kimono for $9.99. 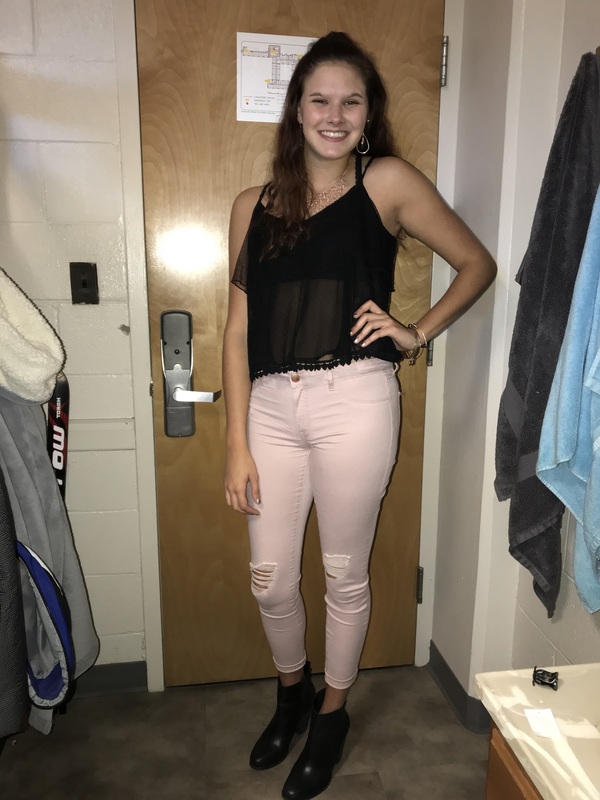 Brittany was on the hunt for a pair of pants and some cute jewelry to go with her sheer top from AEO. She found a pair of rose pink ripped jeans for $9.99 on clearance and an awesome rose gold necklace for $5.99 to finish the look for $30.97, so a little over budget. Brittany used her own black booties and leather jacket to add to the look and make it her own. I found a black ribbed crop top for $11.99, high-waist pink skinny jeans for $9.99, and a gold choker for $2.99 to top it off for a whopping total of $24.97. The $30 outfit challenge was much harder than we all expected, but it was very fun trying to bargain hunt with my friends. It’s a great way to shop on a college budget and super fun to get some friends together and see who can get the most for $30 or below. Happy shopping!